This new image of the reflection nebula Messier 78 was captured using the Wide Field Imager camera on the MPG/ESO 2.2-metre telescope at the La Silla Observatory, Chile. 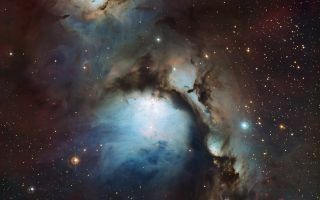 This new space wallpaper of the reflection nebula Messier 78 was captured using the Wide Field Imager camera on the MPG/ESO 2.2-metre telescope at the La Silla Observatory, Chile. This colour picture was created from many monochrome exposures taken through blue, yellow/green and red filters, supplemented by exposures through a filter that isolates light from glowing hydrogen gas. The total exposure times were 9, 9, 17.5 and 15.5 minutes per filter, respectively.